Gold Mine, Omagh, Co. Tyrone - Environmental emissions monitoring (surface water, groundwater and dust) for a major open-cast gold ore extraction outside Omagh to satisfy planning conditions and discharge consent requirements. Basalt Quarry, Antrim, Co. Antrim - Hydrogeological investigations to determine the cause of groundwater level fluctuations within a basalt quarry. 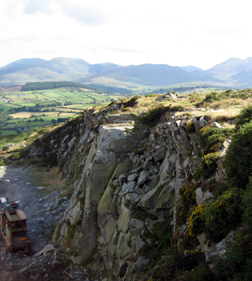 Proposed Granite Quarry, Castlewellan, Co. Down - Hydrogeological and hydrological assessment of a proposed Mourne Granite extraction as part of an Environmental Impact Assessment. Former Basalt Quarry, Limavady, Co. Londonderry - Hydrogeological assessment and risk modelling as part of proposals to convert a former basalt quarry into a waste management facility.